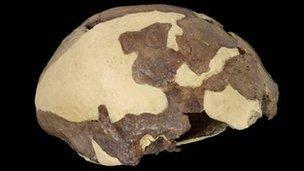 Scientists have collected more evidence to suggest that ancient and modern humans interbred in Africa. The result suggests that the ancestors of early humans did not die out quickly in Africa, but instead lived alongside their descendents and bred with them until comparatively recently. It is longer and flatter with a strong brow ridge; features closer to a much older skull from Tanzania, thought to be around 140,000 years old. Prof Katerina Harvati from the University of Tuebingen in Germany used new digitising techniques to capture the surface of the skull in detail. The new technique improved upon the original measurements done with callipers by letting researchers see subtler details about the skull's surface. But palaeontologists are not all agreed on precisely what the new analysis is telling us - or, indeed, whether it is telling us anything definitive at all. 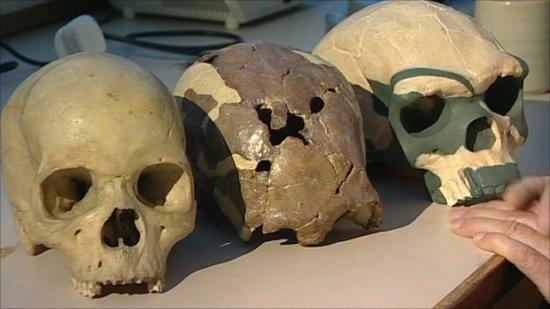 "I do not think that these findings add anything new to our view," said Prof Clive Finlayson, director of the Gibraltar Museum, who was not connected to the study. "We have a few fossils, and no idea of natural variation within populations. That the situation is not simple and is deep and complex is what we would expect. "In my view, it is the field of genetics that will help us most in clarifying matters," he told BBC News. Separate research published earlier this month suggests that genetic mixing between hominin species happened in Africa up to 35,000 years ago.